Reuters – Chinese telecoms giant Huawei Technologies Co Ltd’s chief financial officer was arrested as part of a U.S. investigation of an alleged scheme to use the global banking system to evade U.S. sanctions against Iran, according to people familiar with the probe. Al-Arabia – As the United States completes its withdrawal from the Iran nuclear agreement, security analysts warn of more frequent and dangerous cyber attacks from Iran. RFL/RE – State television says Iran has begun the mass production of a locally designed fighter jet. RFL/RE – Internet freedom continues to wane worldwide under pressure from attacks on informed democratic debate and notions of privacy, with “a cohort of countries…moving toward digital authoritarianism,” U.S.-based democracy monitor Freedom House has warned. 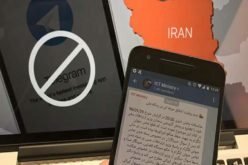 RFL/RE – Facebook says it has deleted accounts originating in Iran that featured posts on politically divisive topics and attracted more than 1 million followers in Britain and the United States.